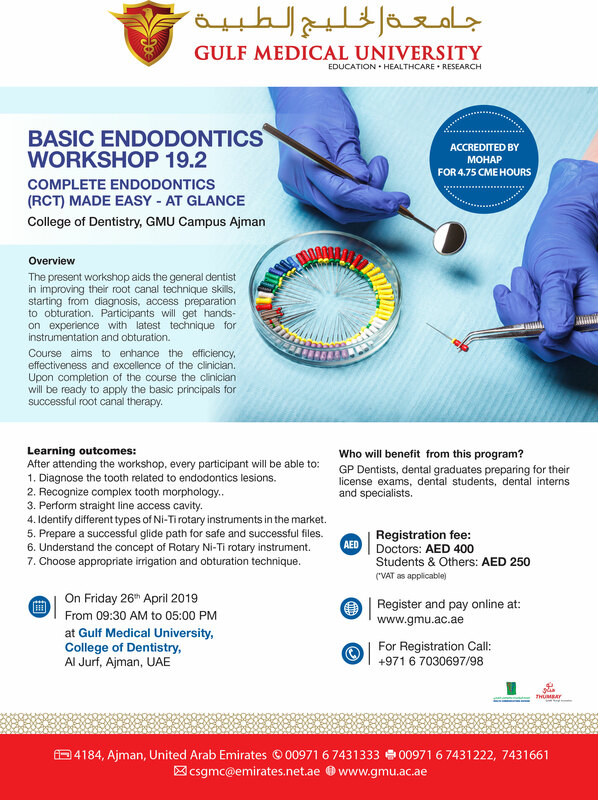 The present workshop aids the general dentist in improving their root canal technique skills, starting from diagnosis, access preparation to obturation. Participants will get hands-on experience with the latest technique for instrumentation and obturation. The course aims to enhance the efficiency, effectiveness, and excellence of the clinician. Upon completion of the course, the clinician will be ready to apply the basic principals for successful root canal therapy. Diagnose the tooth related to endodontics lesions. Perform a straight-line access cavity. Identify different types of Ni-Ti rotary instruments in the market. Prepare a successful glide path for safe and successful files. Understand the concept of Rotary Ni-Ti rotary instrument. Choose appropriate irrigation and obturation technique. GP Dentists, dental graduates preparing for their license exams, dental students, dental interns, and specialists.